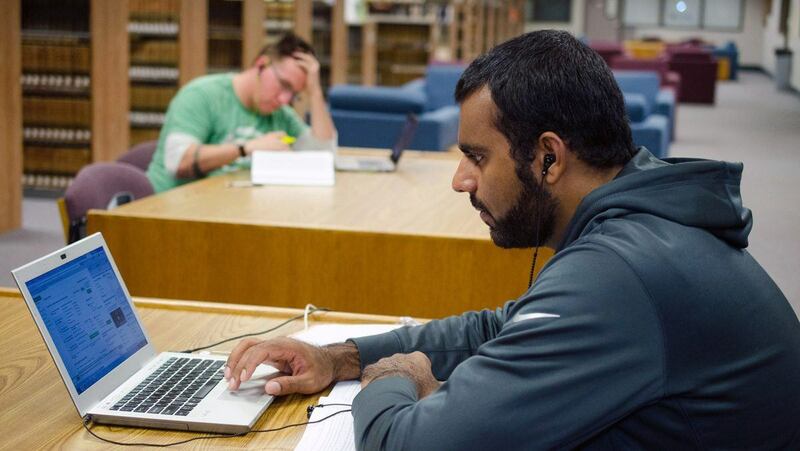 Although the La Verne Law Library primarily serves the students and staff of the College of Law, it is also open to all members of the University community. In addition, students and faculty from other law schools, students and staff from IEALC institutions, and licensed attorneys may use the library for free. Others may use the library by paying the appropriate membership fee after the first visit, which is free. For further information, consult staff at the Circulation Desk, which is on the right as you enter the library. After the first visit, visitors who do not wish to purchase an annual membership may pay $10 per visit. The individual payments will be applied toward the annual fee. Visitors who wish to use government documents kept in the library are not charged a fee. All library users are subject to the Law Library’s Guidelines for Visitors. Any visitor who fails to abide by library policies—or who appears to be a nuisance or danger to others—may be removed at the discretion of the library director or his designee. Wireless (WiFi) Internet and computer lab network access are available to University of La Verne faculty, staff, and students through the University’s account authentication. Fee-paying members and other authorized uses may request WiFi access for the duration of their subscription at the Circulation Desk. Other visitors may request temporary guest access by completing an online form. Limited Internet access is also available, subject to the Guidelines for Visitors, at a public terminal near the Circulation Desk. Visitors are permitted access to the Law Library for the purpose of conducting legal research using library materials, including digital materials available at the public terminal in the entrance to the library. Visitors are required to register at the circulation desk and pay the appropriate fee before using the Law Library. Visitors are required to sign in and show photo identification at the security desk each day they enter to use the Law Library. Visitors are welcome to request library services from library staff, but visitors should not approach law students to ask questions or initiate conversations. Use of the public terminal by library visitors is limited to one hour per day. Use of the computer lab is available only to current University of La Verne students and staff. Food is not allowed in the Law Library, study rooms, or computer lab; non-alcoholic beverages are allowed in covered containers, except for the computer lab. Use of tobacco products of any kind or of electronic cigarettes is not permitted in the Law Library. All library patrons should refrain from loud talking or creating disturbances of any kind and should treat other patrons and staff with respect. Failure to follow these guidelines—or appear to be a nuisance or danger to others—can result in revocation of library privileges and removal from the premises, at the discretion of the library director or his designee.